Whilst other snow users get to have a rest, a bite to eat, or make a visit to the toilets, the skibiker will have to smile and answer the following commonly asked questions. How do you stop without brakes? - Drift the rear ski or turn uphill. Is that fun? - Yes, a longer explanation can be found here. Is that hard to learn? - No, it is easy to learn (but hard to master). Do you need lessons? - Yes, about an hour should enable you to ride safely. How do you get that thing on a chairlift or do you have to walk up? - Place it on your lap or between your legs and sit down. Is it tiring to ride? - No, about 30%-50% of the effort of other snowsports. How do you pedal that thing? - You don't on most, but you can on one of these. How does it work ? - Hmmm.... watch me! Where can I hire / buy / build / steal one of those? - This is a moot point, please don't steal mine. For those skibikers with weak bladders or poor diplomatic skills The SkiBiker SkiBike Blog will be selling laminated FAQ cards for the 2013 season! Many thanks to the skibikers from the Snow Biking / Ski Biking FaceBook Group who thought of some new ones to me. 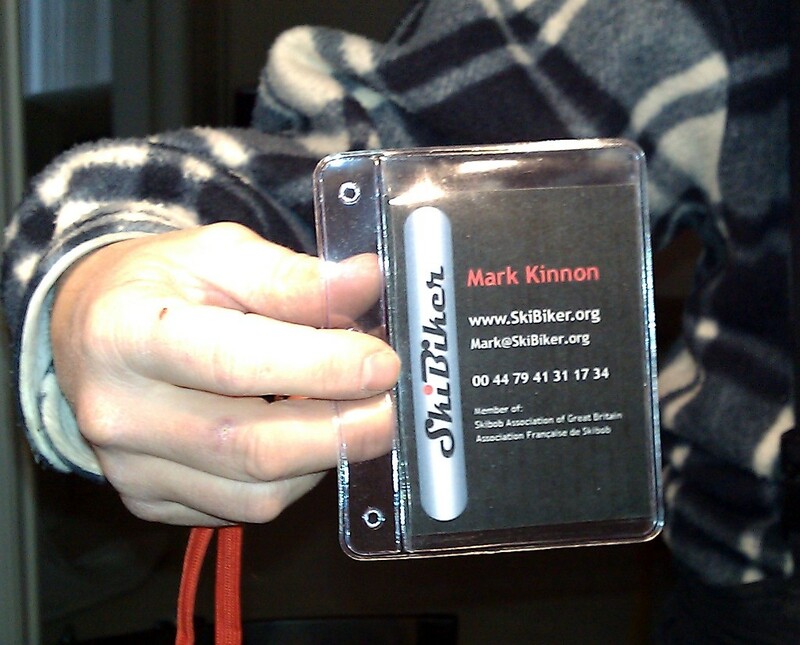 SkiBike FAQ cards - available for the 2013 season! A note from the author, regarding #8 "Can you do tricks?" this is definately something I need to work on, unless you count crashing in a heap as a trick. However, this season (2012), I did get the knack of riding the easy bits sat down with my feet resting on the fork crowns.